This five-ingredient ice cream pie takes just minutes to assemble. 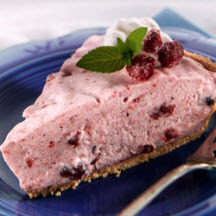 Stir a can of cranberry sauce and a little orange peel into softened ice cream and spoon into a pie plate lined with cookie crumbs. Spray a 9-inch pie plate with nonstick coating. Cover with the crushed cookies. Set aside. To serve, cut into wedges. Garnish with sugared cranberries, if desired. *Note: To make sugared cranberries, roll frozen cranberries in sugar. Make-Ahead Tip: Prepare pie as directed. Freeze for up to one month. Nutritional Information Per Serving (1/8 of recipe): calories: 176, total fat: 3g, saturated fat: 1g, cholesterol: 11mg, sodium: 83mg, carbohydrate: 36g, fiber: 1g, protein: 2g.